Amnesty International is calling on Indonesia to drop treason charges against three Papuan political activists. Yanto Awerkion, Sem Asso and Edo Dogopia were among six members of the West Papua National Committee (KNPB) arrested in December, when police and military took over the group’s secretariat in Timika. The three men were detained on 5 January and later charged with treason, which carries a maximum sentence of life imprisonment in Indonesia. Amnesty International said Papua police must unconditionally release the activists because they have only expressed their political views. “They were charged and detained solely for exercising their rights to freedom of peaceful assembly and expression,” Amnesty International said in a statement. 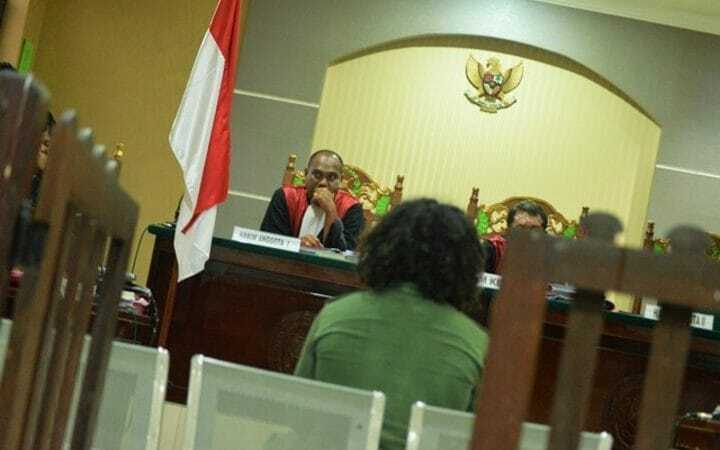 West Papuan political prisoner Yanto Awerkion is sentenced to ten months jail for treason by an Indonesian court.